Huge Savings Item! Free Shipping Included! Save 16% on the adorini Travel Humidor Cedro by Adorini at Blog Free Here. Hurry! Limited time offer. Offer valid only while supplies last. Adorini Travel Humidor Cedro • capacity: 13 cigars • adorini premium travel humidor with scratch-resistant veneer from real Spanish cedar. • adorini premium travel humidor with scratch-resistant veneer from real Spanish cedar. • This humidor demonstrates that a functional travel humidor does not need to be of plastic. Travel with style. • Two levels of innovative foam inlays prevent any movement of each cigar during transport. • Inside lining from Spanish cedar wood. 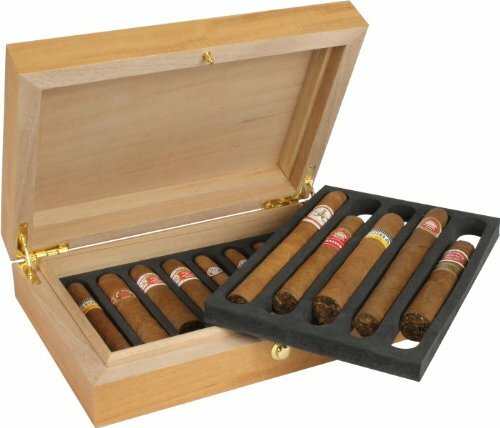 • Foam inlays are removeable, which makes this a truely dual purpose humidor. At home you can remove the foam elements and enjoy the full capacity of the humidor and on the go you can protect your cigars by using the foam inlay with openings for different cigar formats. • Gold plated button lock to prevent any unintentional opening on the go. If you have any questions about this product by Adorini, contact us by completing and submitting the form below. If you are looking for a specif part number, please include it with your message.